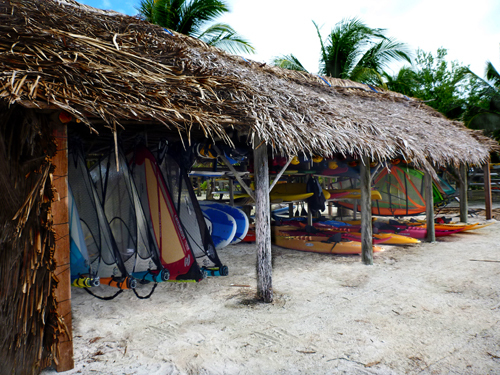 On our island out at Glover’s Reef in Belize, we offer 10 sports: sea kayaking, snorkeling, scuba diving, kitesurfing, windsurfing, kayak surfing, sport fishing, kayak fishing, paddleboarding, and board surfing. It is great having so many sports, because if it’s too windy to sea kayak, it might be perfect for one of the surfing sports. It the surf is flat because there is no swell coming from the greater Caribbean, then snorkeling and sea kayaking are unbelievably good. It’s rare that we can’t do anything because we have so many options. 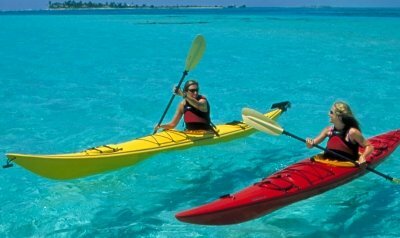 Our most popular sport is probably surf kayaking. Very few people come to our island for surf kayaking because it’s not a well-known sport. Regular board surfing or paddleboard surfing are much sexier, so we do get a lot of advance interest in those. But when our guests get to the caye and realize how easy and how much of a blast surf kayaking is, you can’t get them out of the water. 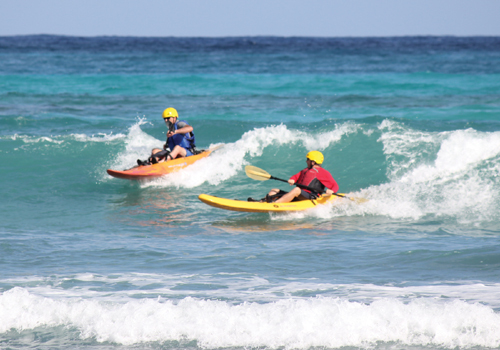 You can start surf kayaking instantly, which is not true of the other surf sports, they take a great deal of practice. We have this wonderful wave that is usually medium-sized. It’s sometimes huge, but not often. It is like it was made for surf kayaks. Our favorite surf kayak, hands down, is the Kaos by Wilderness Systems. But guess what, and I bet you already know what I am going to say; they don’t make them anymore. We have a fleet of about 12 surf kayaks, and often all 12 of them are on the water. We drive all of our gear down from Utah, and so we take very good care of our boats on the island because it’s a huge hassle to replace anything. We have all the equipment to fix all of our gear, and we are constantly fixing our boats and boards. But nothing lasts forever, and a few of our Kaos kayaks are starting to die. Cully has been looking for more of them for years. 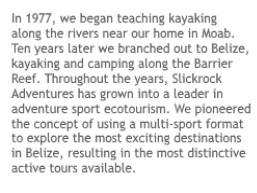 Recently he did a search and found a kayak store in California that had THREE brand new Kaos surf kayaks left. Cully was so excited he paid retail for them, something we never do. Our kitesurf instructor Jasmine went and got them for us, and they are now stored at Jasmine’s parent’s house. My best friend from high school is going to drive them out to us in September. This is how much we want these boats! So just a week or two after we found these miraculous boats, presumably the last Kaos kayaks left in the country, we got an email from a past guest, Dave Petty. Dave joined us on the island over two years ago. Apparently he is still thinking about how much fun he had surf kayaking with us, because he is now looking for his own boat, and he was writing to ask us where to get Kaos kayaks, because he couldn’t find any. Funny you should ask! We told him of our saga and he said, well what is an alternative? Cully really knows river and surf boats, and he replied that he didn’t know of an alternative, as we have tried numerous other boats and none compare to the Kaos. Cully’s only recommendation was to call surf shops in Santa Cruz, CA which is more or less the headquarters for surf kayaking in the US, and just go with their recommendation. So it turns out Dave does not give up! He takes Cully’s advice, and somehow ends up speaking with a National Champion surf kayaker named Dave Johnson from Santa Cruz. Dave Johnson recommended a boat made in New Zealand, but with a US distributor, called the Cobra Strike. Dave Petty sent us the link to this boat to get Cully’s opinion. Cully was extremely excited, he didn’t know about the Strike, and said that it looks like an awesome surf kayak, probably even a better design than the Kaos. He plans to start buying this boat once our remaining Kaos boats start wearing out. He was very appreciative to Dave for finding it, as he didn’t know there was such a good alternative out there. Let’s hear it for people like Dave Petty who never give up in their search for better toys!